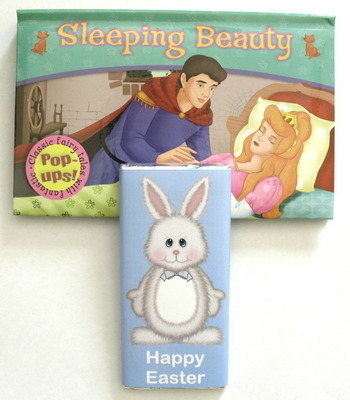 1 x 40g personalised MILK chocolate bar with choice of any of our children's designs and a fairy tale pop up book (6 titles to choose from). Personalisation on the wrapper can be changed to suit your requirements and is not limited to the wording you see in these examples. The only wording we cannot change is anything included in the actual artwork itself. All wrapped up in clear cello bag and tied with curling ribbon. Please choose your wrapper design and book choice from the drop down menu's.